Residents in New Ferry have been reacting to an ambitious housing masterplan for the area, which aims to regenerate the town centre and increase footfall to support nearby businesses. In response to the devastating New Ferry explosion in 2017, three draft proposals were presented to members of the community during a series of public consultation meetings last week. The aim is to collect as much opinion as possible before any final decisions are made. The options involve up to 105 homes being built across the three sites, or alternatively, slightly less housing and more parking space preserved. 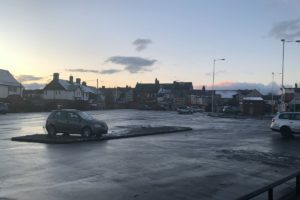 Three locations to accommodate residential development have been identified, including the council-owned and currently underused Woodhead Street car park, New Chester Road, as well the site of the gas explosion on Boundary Road. However, Mark Craig, who’s chair of the New Ferry Town Team regeneration group, said he was “disappointed” by the plans, arguing the scheme is focusing too much on residential development, with no consideration for new commercial properties. He told JMU Journalism: “The plans do not allow for any new replacement shops at all. We know that there are people who want to come to set up businesses in New Ferry, but there aren’t enough sufficient premises, including people who lost their businesses as a result of the explosion. “It [the plan] will do nothing for the long-term sustainability of the shops, certainly in the precinct – they’ll die. We need to attract far more people to come into New Ferry than an extra 90 households. The plans as they are will achieve none of that whatsoever. The plans follow the jury’s failure at Liverpool Crown Court to reach a verdict in the trial of Pascal Blasio last week, after he was accused of deliberately starting the explosion. The Crown Prosecution Service is seeking a retrial. Liverpool Echo: Is New Ferry the most neglected town centre in Merseyside? - and how can it change?